Awash with grandiose palaces, battle-scarred forts, windswept deserts, and some of the most vivid turbans ever to be seen, Rajasthan—Land of the Kings—is India at its colorful best. This traveler-friendly northwest Indian state attracts the highest percentage of India's international visitors, which is hardly surprising considering the region's treasure trove of things to see and do. And not very far away, in the neighboring state of Uttar Pradesh, are two more beauties—the breathtakingly beautiful Taj Mahal and the evocative ruins of Fatehpur Sikri. Upon arrival meet by our assistance at the airport or railway station and transfer to the Hotel . Later after wash n change you will be proceeding for sightseeing of Akshardham Temple. The complex displays millennia of traditional Hindu and Indian culture, spirituality, and architecture and World’s largest Comprehensive Hindu Temple. Also do not miss the evening cultural boat ride where you sail through the 10000 years of India’s glorious heritage. Later return to the hotel and overnight at hotel. After breakfast drive to Mandawa. En route visit Jhunjhunu. On arrival Mandawa check in at the hotel. Afternoon visit Mandawa’s painted Havelis and Village the Mandawa is known as “Open Air Art gallery”. Overnight stay at the hotel. After breakfast drive to Bikaner en route visit to the Havelis of Navalgarh. The Nawalgarh was founded in the 18th Century by Nawal Singh, it has some of the finest frescoes in the Shekhawati region. A huge fort with a colourful bazaar and numerous havelis with elaborate architecture make it an interesting destination. There are a few prominent havelis like Anandilal Poddar Haveli, Aath Haveli, Hodh Raj Patodia Haveli, etc., which are to be visited, as also the two forts. Overnight stay at hotel. After breakfast check out and after sightseeing of Golden Fort/Bikaner Fort, Lal Garh Palace and Deshnok Rat Temple thereafter continue your drive to Jaisalmer. En-route visit Pokhran Fort. On arrival Jaisalmer check into the hotel. Overnight stay at the hotel. After breakfast proceed for full day city tour of Jaisalmer, visit the Jaisalmer Fort, Havelis, Manak Chowk, Gadisar Lake, also visit painted & colorful market. In the afternoon go for an excursion to Sam Sand Dunes (40 kms from Jaisalmer city). Take camel safari at desert and enjoy the sun set. Later drive back to Jaisalmer and transfer to your hotel. Overnight stay at hotel. After breakfast drive to Jodhpur. Upon arrival hotel check in. Later free for evening activities takes a scroll in the market or time for shopping. Overnight at hotel. After breakfast later visit Mehrangarh Fort, the Jaswant Thada and the Umaid Bhawan Palace. Overnight stay at hotel. After breakfast drive to Udaipur the City of Lakes. En route covering the sightseeing of Jain Temple Complex of Ranakpur. Upon arrival at Udaipur check in at the hotel. Overnight stay at hotel. Day 09: Udaipur Local Sightseeing. After breakfast full day city tour of Udaipur, visit City Palace, Saheliyon ki Bari (Gardens of the maids of Honor), Museum and Jagdish Temple. In the evening take a boat ride at Lake Pichola. Overnight stay at hotel. After breakfast check out and leave for Chittorgarh. Upon arrival check-in at hotel. Later visit the Fort, Padmini Palace and the Tower Victory. Overnight stay at hotel. After breakfast check out and transfer drive to Pushkar. En-route visit the Eklingji temple and the Nagda temple (Jain group of temples). Upon arrival at Pushkar check in at hotel. In the afternoon visit Ajmer (Tomb of Sufi Saint, Hazrat Khwaja Moinuddin Hasan Chishti) & Brahma Temple the world only temple dedicated to Lord Brahma in the world. Overnight stay at hotel. After breakfast check out and drive to Samode. Upon arrival at Samode check-in to one of the most famous Grand Heritage Property of Samode and experience the real king like luxury. 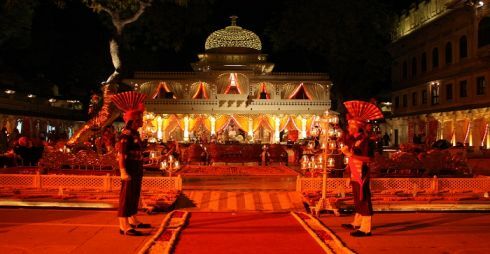 The palace retains its erstwhile ambience and charm. There are numerous memorabilia of the bygone years. Overnight stay at hotel. After breakfast visit Samode village and enjoy the beauty in & around, later check out drive to Jaipur. On arrival Jaipur, our representative will assist in your check in process at hotel. Evening free for shopping around the local market. Overnight stay at hotel. In the morning visit the Amber Fort ascend fort on elephant back. (Subject to availability) Amber was the ancient capital of Kachhawaha dynasty for long time ago. It was moved to newly created Jaipur. Visit the Sheesh Mahal (Hall of victory) which is a hall glittering with mirrors. Afternoon visit Maharaja's City Palace, the Observatory and drive past to Hawa Mahal. Evening transfer to hotel or free for shopping in the local market. Overnight stay at hotel. Morning visit the famous Taj Mahal in sunrise, built by Mughal Emperor Shah Jahan in memory of his wife Mumtaz Mahal. After breakfast drive back to Delhi, En route visit Sikandra, the Akbar’s tomb. On arrival at Delhi transfer to airport for your onward destination.